Royce is a single-author blog theme for Ghost. Featuring a minimal, subtle, responsive and content-focused design. 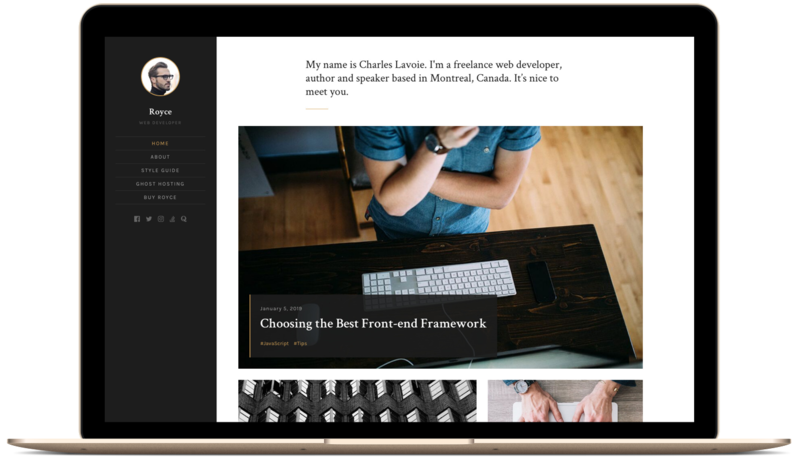 Meet Royce, a single-author blog theme for Ghost. This amazing theme is built for professional writers (Ghost Koening editor support), developers (Prism syntax highlighter included) or content marketers (SEO optimized with well-integrated sharing experience) who are looking for minimal and and fast theme. Royce is a perfect choice to start your online journey and grow your audience. Share your ideas with a Ghost theme that is focused on content delivery and sharing. Download Royce today! So what does the Royce theme come with? If you are comfortable with editing theme template files, it will be easy to customize this theme. If you are not, we provide a theme customization service and can help you with that. Just fill out our contact form and we will get back to you as soon as we can. You will regularly get theme updates with new theme features and bug fixes. Also, we make sure that the Royce theme is compatible with the newest Ghost version. Royce features a responsive design, that means your site will adapt smoothly to any screen size from desktops down to mobile phones. In addition to extensive theme documentation, we provide swift, one-on-one email support. We know our themes inside out, ask us anything. The subscription grants you 12 month access to the theme, theme updates and swift email support. What will happen when my subscription expires? If you decide to let your subscription expire, you can continue to use the theme you've downloaded during your active subscription forever. But you will no longer have access to theme updates and support. Your subscription will be renewed at the same price you initially paid for unless you have a promo code or discount. Then you will pay less than the initial subscription price. Most issues can be worked out before a refund is necessary. We will help you set up your theme and provide all necessary guidelines and recommendations to get you started as quickly as possible. Refunds will only be considered in special cases if the theme you purchased is broken, malfunctioning or corrupt.